Boston Ballet dancers perform Antony Tudor's Dark Elegies (1937) under the direction of Tudor expert Donald Mahler in 2008. The Boston Ballet is an American professional classical ballet company based in Boston, Massachusetts. The company, founded in 1963 by E. Virginia Williams,  and Sydney Leonard, was the first professional repertory ballet company in New England. 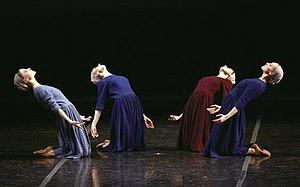 Boston Ballet’s national and international reputation developed under the leadership of Artistic Directors Violette Verdy (1980–1984), Bruce Marks (1985–1997), and Anna-Marie Holmes (1997–2000). Today, Boston Ballet is one of the major ballet companies in North America and among the top companies in the world. Current Artistic Director Mikko Nissinen was selected to lead Boston Ballet in September 2001. Under his artistic direction, Boston Ballet maintains an internationally recognized repertoire of classical, neo-classical and contemporary works, ranging from full-length story ballets to masterworks by George Balanchine, to new works and world premieres by contemporary choreographers. Nissinen leads the company, and Boston Ballet School, the largest ballet school in North America, with Executive Director Meredith (Max) Hodges. In May 1990, Natalia Dudinskaya and Konstantin Sergeyev, along with then-assistant artistic director Anna-Marie Holmes, staged a new production of Swan Lake featuring Boston Ballet dancers performing the leading roles with dancers from the Kirov Ballet and the Bolshoi Ballet. [ citation needed] In recent years, the Company has added James Kudelka’s Cinderella, George Balanchine’s Coppélia, Jewels, and Midsummer Night’s Dream, the American premiere of Jirí Kylián’s Black and White and John Cranko's Onegin, The Taming of the Shrew and Romeo and Juliet to its repertoire. In fall 2009, Boston Ballet's sole performance venue became the Boston Opera House. Located in the Boston Theater District, this 2,500-seat theater provides clear sightlines and has a newly renovated orchestra pit. Boston Ballet’s The Nutcracker has been performed annually for 42 years. Over 35 performances employ the talents of the entire company and more than 250 Boston Ballet School students who join in the production every year. Boston Ballet’s headquarters at 19 Clarendon Street in Boston’s South End neighborhood is one of the largest and best-equipped dance spaces in the country. [ citation needed] Designed by architect Graham Gund, this five-story, 60,000-square-foot (5,600 m2) building is an important hub for dance in New England. See also: Category:Boston Ballet principal dancers. See also: Category:Boston Ballet soloists. See also: Category:Boston Ballet dancers. See also: Category:Boston Ballet II dancers. Background: Boston Ballet School, was founded in 1979 by E. Virginia Williams. The program was officially incorporated as Boston Ballet School in 1979 and since then has grown from a small, regional dance studio into a dance education institution that now also includes Outreach programs like Citydance, Adaptive Dance, and Taking Steps and summer programs like Summer Dance Program and Summer Dance Workshop. Each year select students from Boston Ballet School perform in productions with the company including The Nutcracker in which more than 250 Boston Ballet School students rehearse and perform every year. Enrollment: Students aged nine and older with previous ballet training, are required to take a placement class to determine the level of study best suited to their abilities. Group placement classes are typically held at each studio beginning May through August for September enrollment. Students ages two through eight are placed by age. Facilities & Locations: Basic ballet classes for students of all ages are offered in the Ballet’s Boston studio located in the South End, the Newton Studio in the MetroWest, and the Marblehead Studio on the North Shore. Each state-of-the-art facility is temperature-controlled for comfort, and each features convenient dressing rooms and lounges. Director, Boston Ballet School: Margaret Tracey Principals: Tamara King, MetroWest Studio, Jessica Kreyer, North Shore Studio. Friends of Boston Ballet is a membership program which provides unrestricted annual operating support that funds the Company's on stage work, and its wide range of education and outreach programs. ^ "Company Dancers: The Company". Boston Ballet. Archived from the original on October 9, 2015. Retrieved July 16, 2017. ^ "Cupcakes & Conversation with Lia Cirio, Soloist, Boston Ballet". Ballet News. May 11, 2010. Retrieved 8 July 2017. ^ "Cupcakes & Conversation with John Lam, Soloist, Boston Ballet". Ballet News. January 14, 2011. Retrieved 8 July 2017. ^ "Company Dancers: Boston Ballet II". Boston Ballet. Archived from the original on November 19, 2015. Retrieved October 24, 2015. Morris, Marie. (September 12, 2006). Frommer's Boston. Boston: Frommer's; Pap/Map edition. "Boston Ballet announces 2012–13 season including the world premiere of the new Nutcracker". Ballet News. March 26, 2012. Archived from the original on March 24, 2016. Retrieved July 8, 2017.